Johnson’s Japan, Nippon, Kiusiu, Sikok, Yesso and the Japanese Kuriles. 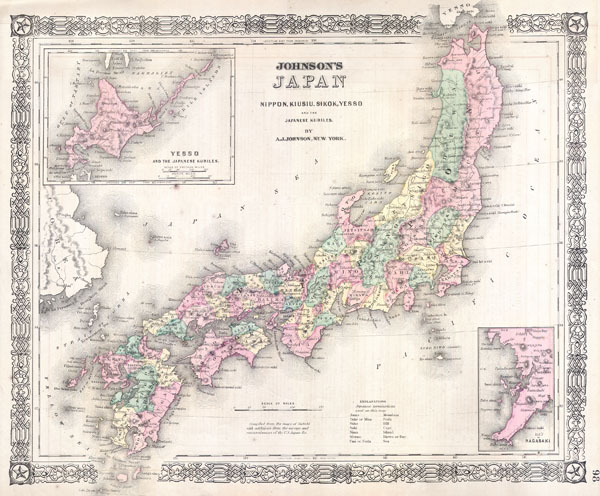 This is a beautifully hand colored 1864 lithograph map of the Japan. There are insets of the bay of Nagasaki and Yesso (Hokkaido) and the Japanese Kuriles. Compiled by A. J. Johnson from the map of Siebold with additions from the surveys and reconnaissances of the U.S. Japan Expedition. Prepared for issue as plate no. 98 in the 1864 edition of Johnson's Atlas. Johnson's New Illustrated (Steel Plate) Family Atlas, (1864 edition). Fine or perfect condition.. Text on Verso.